I’m going to make this post rather short as I’m tired after an exciting, albeit stressful day. First of all, everyone is ok in the DC area from what I can tell. It was quite a ride on the 4th floor of the World Weather Building as it took a few seconds to realize what was happening before the 3-4 violent waves hit the building. Very strange feeling the whole building sway like that. But I digress. . .everyone wants to know about Irene. . .including me. Rainbow IR of Irene at 0015z on 08/23/11. The eye is the "warm spot" (yellow area) surrounded by the colder (red) cloud tops. There she is in all her glory. The Hurricane Hunters have found a central pressure of 965 mb, which is quite low and doesn’t do justice to the 80 knot (90 mph) classification. 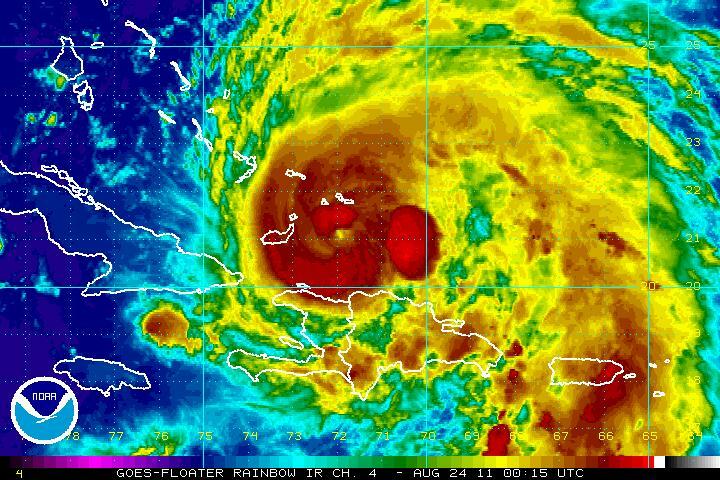 It is possible that the winds have not caught up to the pressure drop as it appears Irene is intensifying rather rapidly tonight. The storm has moved slowly through the day at about 8 knots at 295 degrees (WNW). This motion should continue as the ridging is holding on, but not as strong as I thought it would. It looks as though a small upper low is forming to the northwest of Irene over GA and this could do two things. 1. It could help to ventilate the storm on the western semicircle, thus allowing more intensification and 2. it could provide a more northward shift in the track. . .which is where guidance continues to go with this. 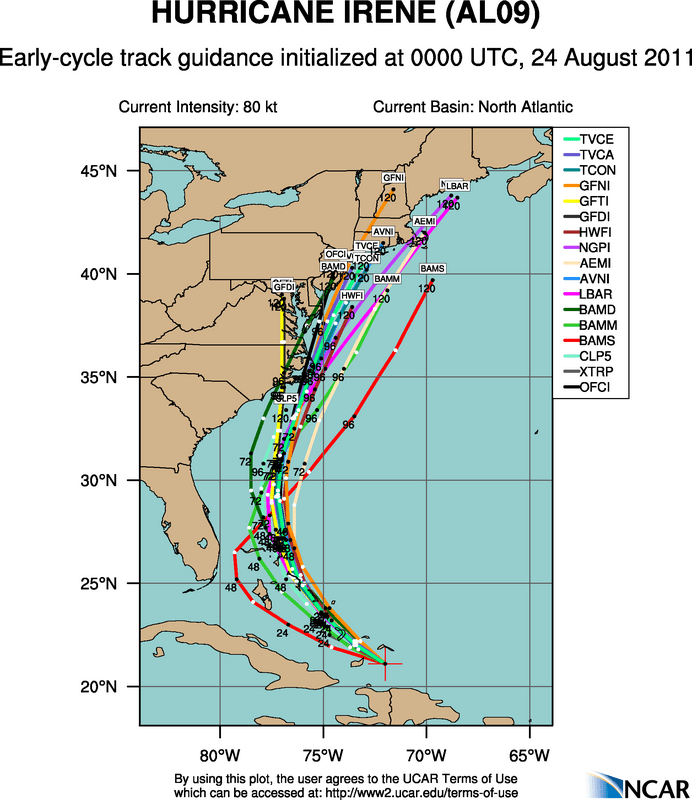 As you can see above, the track guidance has continued the trend of a more eastern track. Although it is still 3-4 days away, I’m starting to believe that we have a storm that skirts or hits Cape Hatteras, NC, then moves north to north-northeast along the coast. This means that anyone from Wilmington to NJ to NYC is on the weaker side of the storm, but still gets quite a bit of heavy rain as the circulation pushes tropical moisture into a stalled out front. This is similar to Hurricane Floyd (1999) or Hurricane Gloria (1985). The wind impacts would be worse from the Outer Banks, Delmarva, NJ coast, and for sure Long Island up to Boston. How strong will the storm be? Intensity guidance shows the storm at about CAT 3 around landfall or closest approach to the Outer Banks, then slowly weakening to CAT 1 or 2 as it undergoes baroclinic (mid-latitude-type weather) transition. Typically, the Delmarva and NJ get winds gusting from 60-70 mph and moderate tidal flooding in these situations, but there is a new moon and tides will already be high. Of course, the Outer Banks, Long Island, and Southern New England would have winds over hurricane force. 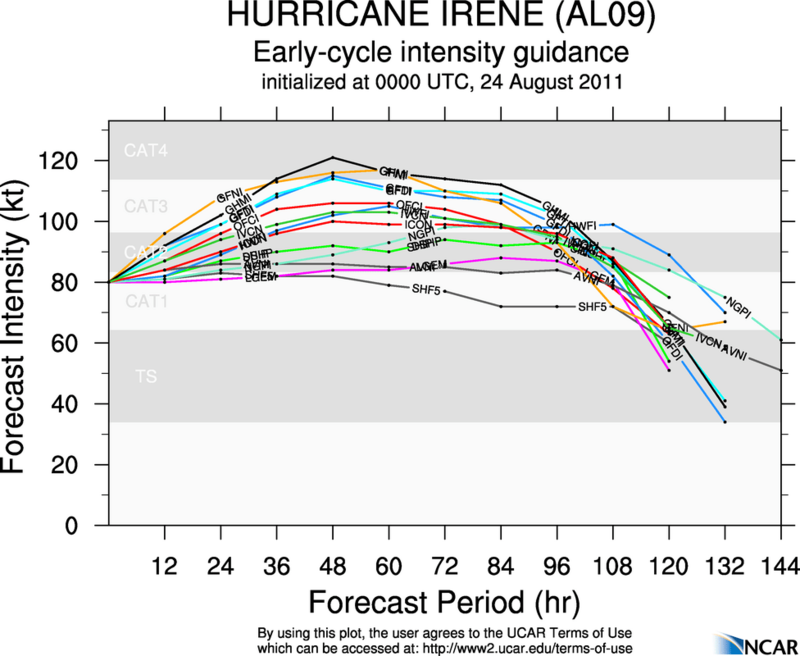 Weather Underground climo map for storms that passed in the vicinity of Irene's current location. One last thing I’ll mention tonight. . .looking at the climatology of systems that passed close to the point where Irene is tonight, it seems rare that a storm hugs the coast all the way to New England on this trajectory. Most have either gone inland around SC/GA or quickly turned out to sea. I’d like to see how the storm reacts to the upper-low to the west tomorrow and see how the ridge responds to a rapidly strengthening Irene. Typically, a strong hurricane pumps the ridge nearby, allowing a more westward trend. I don’t think we will see a violent shift in guidance. . .but models tend to have a right bias on recurving tropical cyclones. Please stay tuned and I’ll try to clear the air more tomorrow. You’re so smart! Thanks for the info!